As my friend Vanessa (Bonkers about Perfume) usually does it, here’s a disclaimer: this is not a perfume-related post. But you know what? If you read my “perfume” posts and are still around, I would bet that this one can’t be that much less interesting/useful. This trip to Hawaii was quite educational, and I do not use it as a euphemism for something unpleasant. Quite literally, I learned many new and interesting trivia bits and had interesting experiences, mostly food-related, which now I plan to share with you. Between 1790 and 1870, sandalwood was a major part of Hawaii’s agricultural industry1. Too bad it’s not any more – it would have been interesting to compare it to sandalwood from other areas. In the 1960s, Hawaii was responsible for 80% of the world’s pineapple. Today, Hawaii produces only 2% of the world’s pineapple. 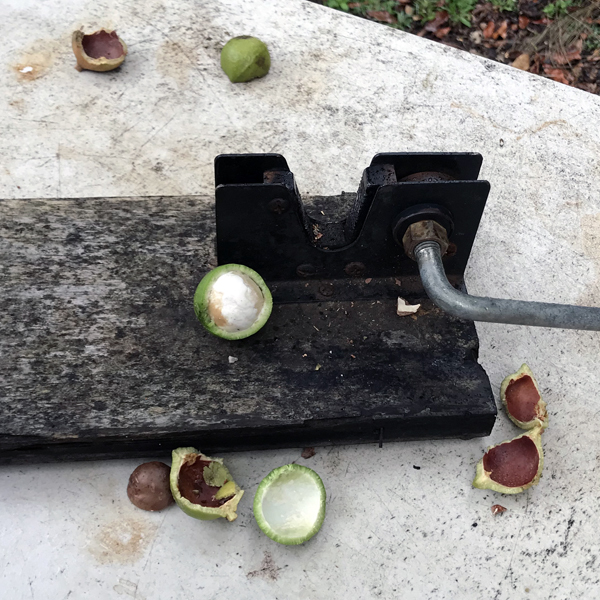 But 90% of the world’s macadamia nuts are still produced there . 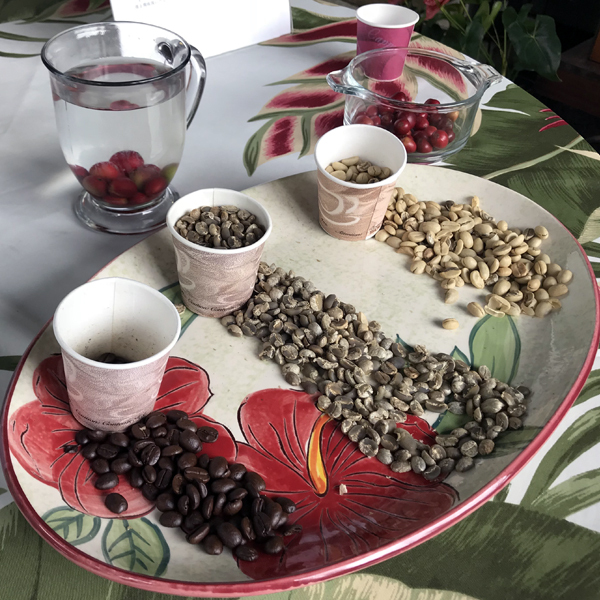 Peaberry coffee (oval, pea-shaped coffee beans) is not a special coffee variety but rather a rare (about 5%) mutation produced by regular coffee trees. Roasted coffee beans are bigger than green ones . 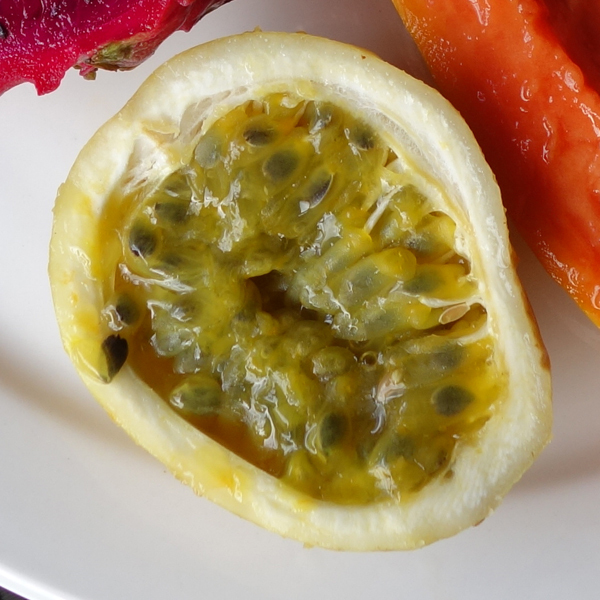 Passion fruit is a vine. 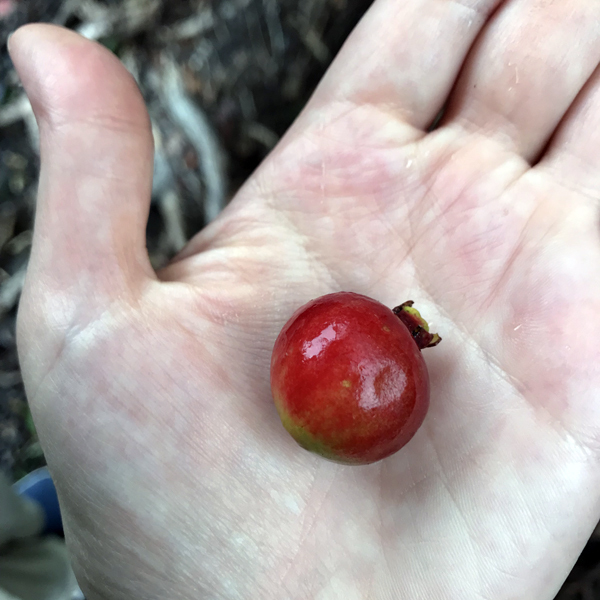 Strawberry guava is considered the most invasive plant in Hawaii . Left not picked, a tea bush can grow higher than the tallest person. 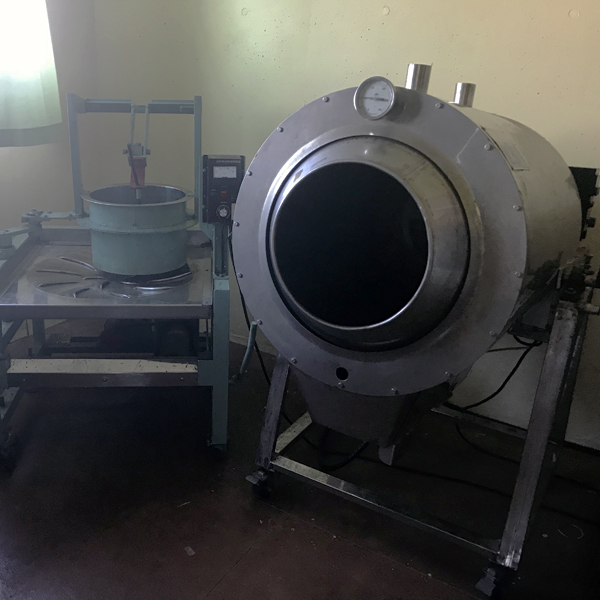 Both green and black tea are grown on the same bush but, counter-intuitively, green tea is “cooked” (leaves are heated in a special appliance, shown below, to stop the oxidation), while black – isn’t . Tea flowers and tea seeds: you can propagate tea by either cuttings or seeds . Tea flowers look beautiful both in rain and on a sunny day. Growing vanilla: it looks like green beans! 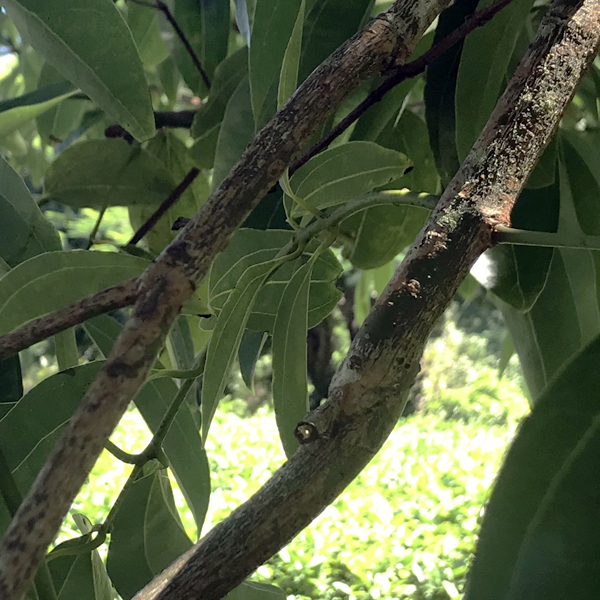 Cinnamon tree: I didn’t realize before that it’s made from the bark is harvested from a live tree . 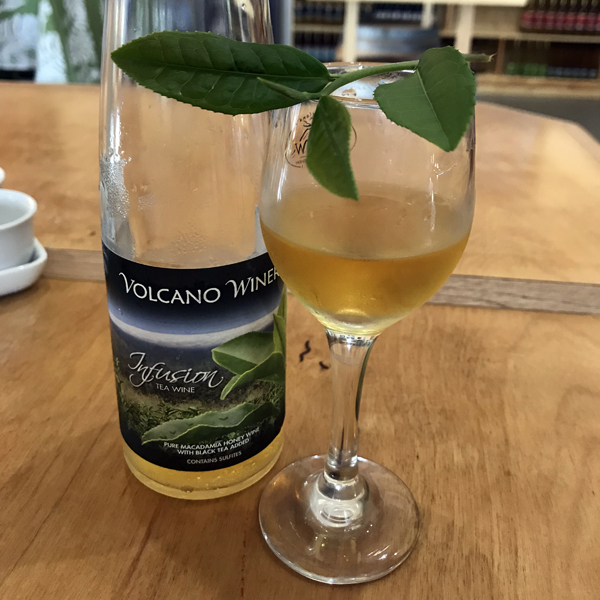 Mead from local honey infused with local tea: it tastes great on a hot day. 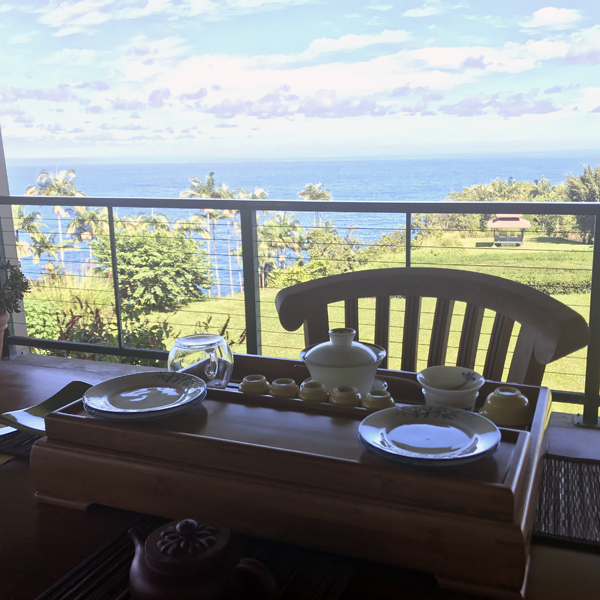 Chinese tea ceremony during which I smelled strong floral scent of one of the black teas: it wasn’t an imaginary or pretend-I-know-what-you-mean scent as it happens sometimes with wine tasting but it actually smelled of flowers . 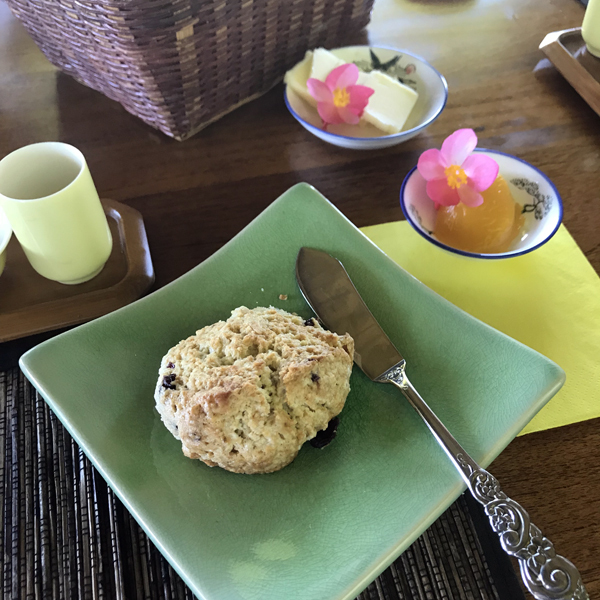 Freshly baked homemade scones with passion fruit curd: we were treated to these in the end of the tea ceremony, and they were so tasty that I started contemplating making them at home. 2 From our visit to Mountain Thunder Coffee Plantation that offers free coffee farm tours lead by enthusiastic staff members, sampling of coffee and other products in their shop, as well as inexpensive nature walks. 4 From the private tour in Onomea Tea Company – three-hour event that included the tour and tea ceremony. It was probably the best experience of this type in my life, so I would highly recommend it. Topic of vanilla perfumes periodically circulates in the Perfumeland, and two-three years ago I could probably be observed commenting on those with the statement of not being a vanilla fan. I never seriously disliked the note, but for a long time I thought that vanilla-centric perfumes weren’t my cup of tea. In some sense I was right: until recently the only two bottles of vanilla perfume in my perfume collection were Vanille Noire by Yves Rocher and Eau Duelle by Diptyque – a mini bottle and a travel bottle, correspondingly. 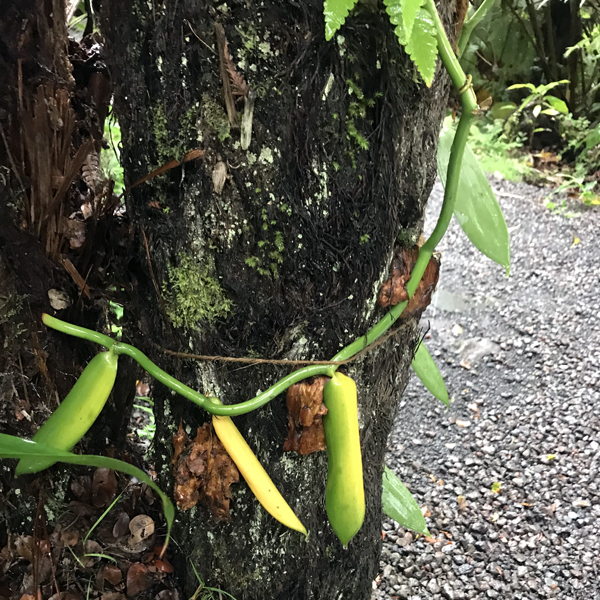 But the “mystery” vanilla perfume that I came across on the last day of my Maui vacation (see the Part 1* post) has triggered my vanilla cravings. 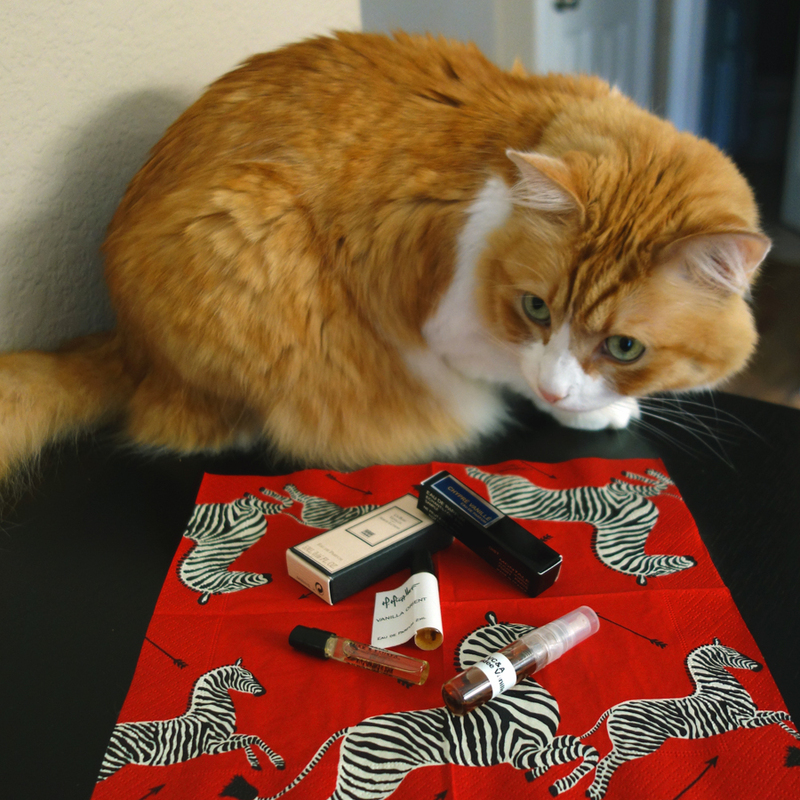 And while I was searching for that brand first and then waiting on the La Maison de la Vanille’s sample set arrival, I discovered that over the years I accumulated a wide variety of decants and samples of vanilla perfumes. So for the next month I wore and tested perfumes with the prominent vanilla note. There are many great Guides to Vanilla Perfumes in the Blogosphere, so I won’t even attempt to write any serious comparison of the perfumes I tried. I’ll just share some personal numbers, observations and conclusions. During that month I sweetened the bitterness of the returning from my vacation with 22 vanilla perfumes. Only one of them – Eau Duelle doesn’t have one or the other variation of the word “vanilla” in the name. 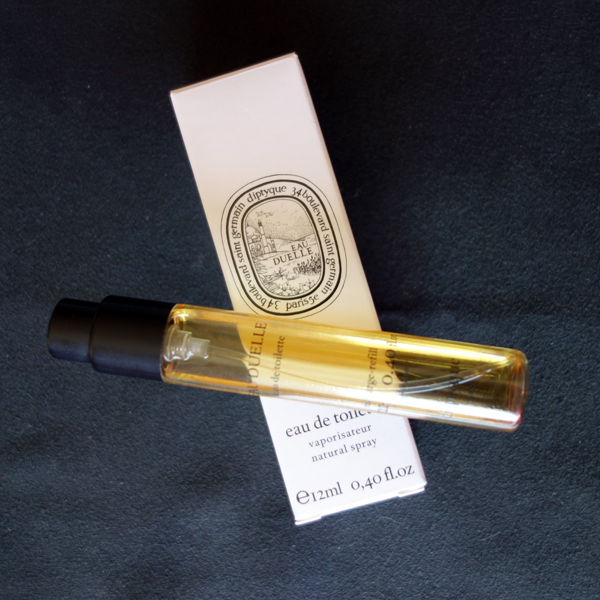 But Eau Duelle is unmistakably vanilla perfume, and I like it, especially in the heat of tropics (and that’s where I actually wore it on the onset of my vanilla kick). Out of 22 perfumes in my experiment, I disliked 11 – so probably I wasn’t that wrong in thinking that I didn’t like vanilla perfumes. I won’t list them all, but mention just several where I have any additional comments. I confirmed to myself that Atelier Cologne’s Vanille Insensée does not work for me, which still surprises me since I find most of their perfumes pleasant even when I do not love them. I also suspect that my sample of Vanille Absolument from L’Artisan Parfumeur is off: though I don’t know how it’s supposed to smell, I don’t think it smells right (or I’ll be extremely surprised since I read many good reviews for it). Five perfumes I neither liked nor disliked: Montale Chypre Vanille, Van Cleef & Arpels Orchidee Vanille, Serge Lutens Un Bois Vanille, Jo Malone Vanila & Anise and M.Micallef Vanille Orient. They were quite nice but all of them were the type that I might wear, in principle, but having so many other great perfumes I would probably never finish even those decants/minis that I have now (Rusty didn’t care much for them either: I couldn’t persuade him to play with them for my camera). That leaves us with 6 perfumes that I quite liked. None of them were new to me: they were my favorites from the previous encounters with them. In addition to the mentioned above Eau Duelle, I liked Guerlain Spiritueuse Double Vanille. I have a decant of it but once it’s gone, I won’t pursue it. Unexpectedly I loved Tobacco Vanille by Tom Ford. “Unexpectedly” – because this is one of the perfumes that I love on my vSO but I’ve never considered it for myself. Now I think that once we finish his decant, I should go for a bottle – to share, of course. I also liked Ormonde Jayne’s Vanille d’Iris though I have some uneasy feelings about it since I think I smell Iso E Super** in it. Good news: I do not smell carrot in it any longer. So I might consider getting one of the 10 ml bottles from their travel set. Or not. By the end of this Single Note Exploration episode I got down to two contenders for the perfect vanilla title – Le Labo Vanille 44 and Mona di Orio Vanille. Thank you, hajusuuri and Suzanne (Suzanne’s Perfume Journal): if it weren’t for your generosity, with me not being a big fan of vanilla perfumes (and absolutely not a fan of Mona di Orio’s creations), I might have never actually tried these two. But I did, found both to be wonderful perfumes and decided to add one of them to my collection. Why not both? Even not talking about the price, these two fit exactly the same niche for me, and I just do not see how I would be deciding every time, which of the two to wear. So after many evenings of the parallel test runs on both wrists, as well as a couple of days of actually wearing each of them, I declared the winner: Vanille by Mona di Orio is my Perfect Vanilla. Now I want to “pay it forward”: I have one 5 ml decant of Mona di Orio Vanille to share. To be entered into the giveaway, let me know in your comment whether you’ve tried and liked it, or want to try it (I assume, if you didn’t like it, you won’t need more of it, but I do not mind your entering into the draw even if that’s the case). There are no other requirements. Open until 11:59 P.M. PST, December 11, 2016. Question to everybody (not related to the giveaway): Can you name just one vanilla perfume that is hands down your favorite? *I doubt anyone would have noticed, but I wanted to explain that usually, when I re-visit the same note in my One Note Exploration series, I name the consequent episodes “Take 2, 3, etc.” But in this case both episodes were the parts of the same tasting spree – hence Part 1 & 2. ** Recently I finally formulated how I feel about this aroma chemical: while I like it on its own (and have a bottle of Molecular 01 to prove it), and I do not mind it in perfumes, I prefer not to be able to pinpoint this ingredient in my perfumes.